We have successfully applied this approach to the discovery of the first small molecule inhibitors of the miRNA pathway. For example, we developed a cellular assay for miR-122 function, conducted a pilot screen followed by a high-throughput screen, and have identified two inhibitors, the amide 1 and the sulfonamide 2, who efficiently silence miR-122 function. 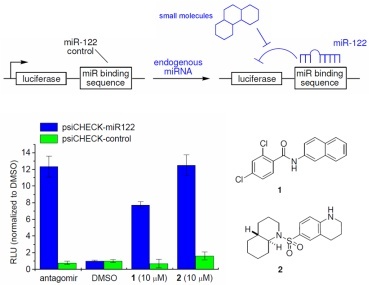 We selected miR-122 as a target, since it is the most abundant miRNA in the liver and is involved in hepatitis C virus infection and other liver diseases.